Something cute and foamy! 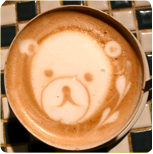 I love all things cappuccino but a bear on top too? That’s almost too much cute to bear! Get it? Ha ha. Oh man. Somebody slap me for telling a dumb joke. Can you tell I am the captive audience to kiddie jokes all day long? Anyway! Cuteness! Coffee! Foam! I need to move to Japan. Thank you Bethany for the link!